This article contains spoilers for Gotham season 4, episode 20, ‘A Dark Knight: This Old Corpse’. Last night’s episode of Gotham was called ‘This Old Corpse’ and it was about a corpse, though not that old. The episode begins with the followers of Jerome Valeska (Cameron Monaghan) having a party/wake on his grave when a woman dressed as a classic harlequin (Francesca Root-Dodson). She plays a recording for them of Jerome giving them final orders including digging up his corpse. We then cut to the police station, where Lee Thompkins (Morena Baccarin) and Jim Gordon (Ben McKenzie) are talking because he arrested her last episode. He wants her to flip on Edward Nygma (Cory Michael Smith) and she wants him to stop worrying about the law and really help people. They’re interrupted by a video tape message sent to Gordon from Jerome saying he wants Jim to throw him a wake at the GCPD and that the guests were already invited. Jerome’s followers surround the building and try to break in. 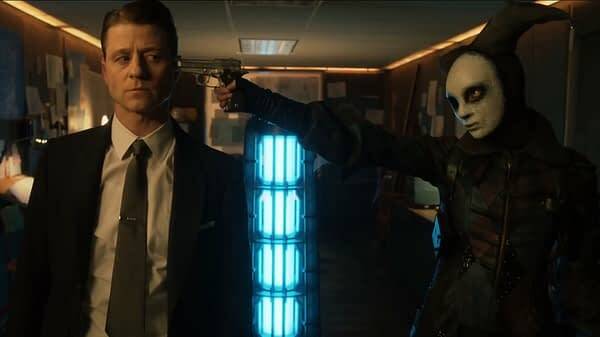 Meanwhile, Bruce Wayne (David Mazouz) is off visiting Jeremiah Valeska (also Monaghan) who has finished his perpetual generator and Bruce starts seeing signs of his insanity. Alfred (Sean Pertwee) calls and warns Bruce about Jerome’s followers and then tries to head over, but he’s taken out by some unseen forces. Gordon as a plan to let the crazees into the station while the cops sneak out through a secret entrance and surround the building, then take them out with tear gas. But the plan goes astray when they break in too soon. The cops get out, but Lee is left inside. Gordon and Harvey Bullock (Donal Logue) torture one of the crazees until he gives up the main plan: to kill Jeremiah and Bruce. Jim races off to Jeremiah’s place, but they have left and are going to Jerome’s grave so Bruce can show Jeremiah that Jerome is really dead. Riddler puts a crew together to go break Lee out, assigning one of them to follow Gordon and help him if he needs it, because Lee wants Jim alive. This might be important later, but we don’t see it in the episode. Penguin (Robin Lord Taylor) decides to get involved and goes to the station with Grundy (Drew Powell), where they take the same guy Jim had tortured… in hopes of torturing him to get the truth. Riddler and his crew get to the station to find it over run by crazees, so he gets a clown costume, sneaks in the way the cops got out, and finds Lee after discovering Jerome’s coffin is filled with beer and ice. At the cemetery, Bruce and Jeremiah find the grave empty and Jeremiah flips out. He runs off. Bruce finds him and Jeremiah pulls a gun, accusing Bruce of being Jerome. They go back to the grave and find Jerome’s body. That’s when the crazees show up to help Jeremiah and hold Bruce. In the bunker, Gordon sees a video of Jerome talking about his plan and how all of this was to get Gordon there. He is then attacked by the harlequin, who turns out to be Ecco, Jeremiah’s assistant, and the video reveals that it’s actually Jeremiah doing all of this. And the generator, when overloaded, turns into a big bomb. Gordon knocks down Ecco, but she escapes and leaves Jim locked in the room with the bomb. But he knows of the secret passage, grabs the map to the bunker, and dashes out as the bomb is ready to go. We see the explosion in the distance as the cops move in to take back their station. Jeremiah tells Bruce that Gordon is dead and that Bruce is his best friend… then knocks him cold. Then Jeremiah and Ecco go to Wayne Enterprises, kill two guards, and look to make off with a whole lot of those perpetual generators that he built. Jeremiah now has a whole lot of bombs and wants to level Gotham so he can rebuild it. The episode had a few fun twists and seem to be setting up their version of the Joker and Harley Quinn, except without the funny. The fact that Ecco can’t speak and Jeremiah plays “sane” takes away from the fun that Jerome had going. Will these be the Joker and Harley, or just another prototype? And it would be hard to believe the Gordon is actually dead, since they introduced the character to help him if needed. There is already talk that Gordon and Bruce will be the two people leading all the good guys in the No Man’s Land scenario too — but it sure looked good. Just two episodes left — first, ‘One Bad Day’, which is supposed to be a play on The Killing Joke. Then there’s the season finale, ‘No Man’s Land’, which is said to be a soft reboot of the series, changing all of the dynamics in the show.